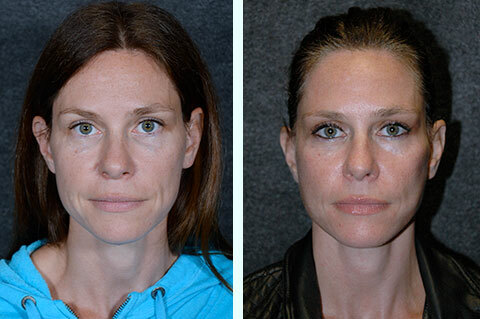 Why women in their forties are getting facelift procedures. Facelift in Forties Before and After. 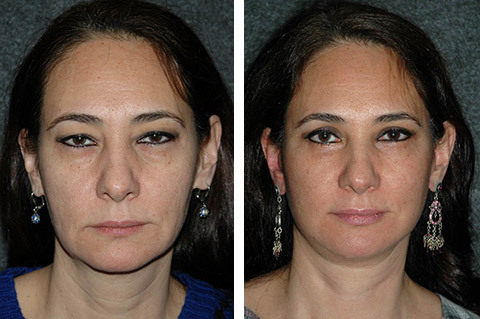 This woman underwent a hybrid mini facelift called a M.A.D.E. 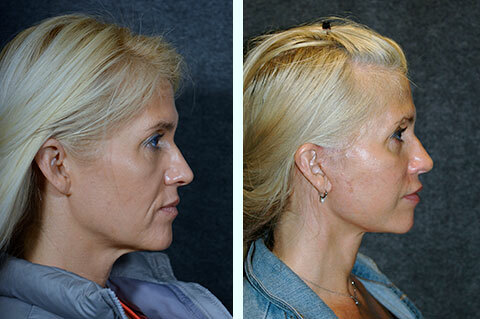 Facelift that an incision hidden behind the ears and lifts the cheeks and early jowling and neck drooping. It is your genetic tendency to form jowls and dropped cheeks and a loose neck at an early age. You look 5 to 10 years older than your chronologic age. Non-invasive treatment like fillers and facial tightening devices no longer give you the rejuvenation they used to years ago. Your work and life schedule do not allow the time to maintain your appearance with multiple visits per year for non-invasive treatments. You want to set the clock back by more than 10 years. You simply want a long-term solution to your facial aging. Facelifts have traditionally been preferred by older women for their dramatic results. Women under the age of 50, on the other hand, have generally preferred non-invasive or non-surgical facelift procedures such as Botox, injectable fillers and facial tightening devices like Ultherapy, ThermiTight and FaceTight. This appears to be changing. In a study entitled “Nonsurgical Facial Rejuvenation Procedures in Patients Under 50 Prior to Undergoing Facelift: Habits, Costs and Results” published in the peer-reviewed Aesthetic Surgery Journal. In this study one of New York’s best facelift surgeon Dr. Jacono notes that the age of women seeking surgical cosmetic procedures has been steadily declining. 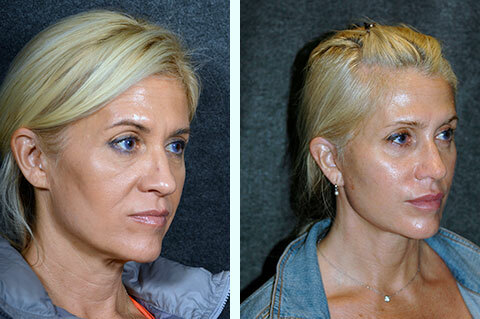 This study examined 157 of Dr. Jacono’s clients who chose to have a facelift while still in their forties. Mini Facelift at 40 s Before and After. 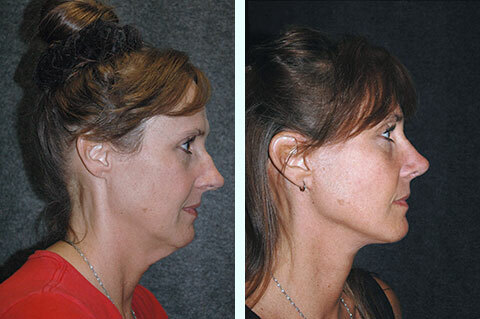 This woman in her mid-forties underwent a mini facelift to treat her smile lines (nasolabial folds), loss of definition in her jawline with jowls, and neck drooping. Her family has a pattern of aging where their neck drops prematurely. She chose surgery because she did not have time for the maintenance required with non-surgical treatments. 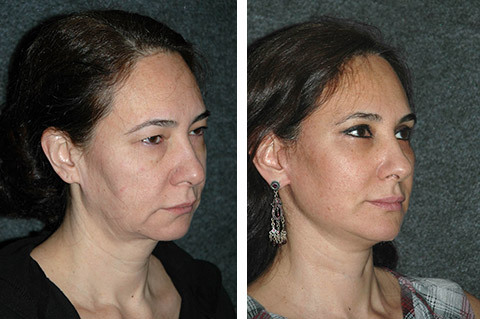 This study revealed that over 50% of the women who chose to have a mini face lift in their forties had previously had injectable filler treatments or laser facial skin tightening prior to opting for a mini-facelift to reduce the appearance of aging. They noted that they looked 4 years younger after these non-invasive treatments but almost 10 years younger after their facelift surgery. There are a few key benefits to choosing non-invasive cosmetic procedures over surgical procedures. 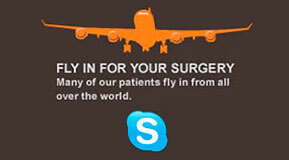 Non-surgical procedures tend to cost less for each individual treatment and have shorter recovery times. For this reason, they are often chosen by women in their thirties and forties who simply need a “tune-up.” However, there are also reasons to choose more dramatic procedures, regardless of your age. Facelift in Early Forties Before and After. 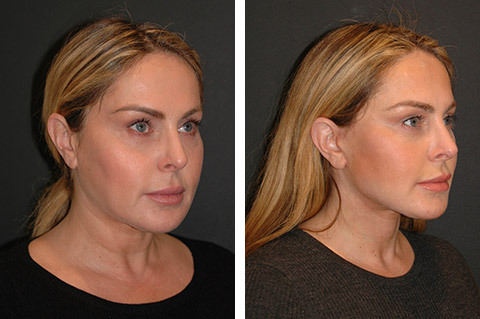 This woman in her early forties had a min face lift called a minimal access deep plane facelift after years of fillers including Voluma, Juverderm and Restylane. 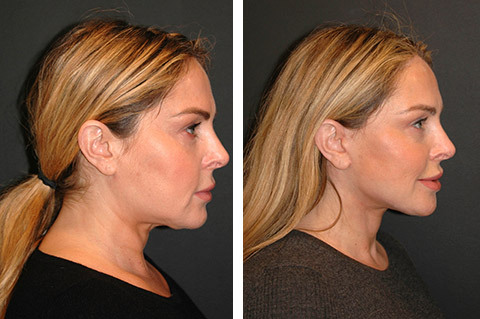 She noticed that the fillers made her face appear wider did not create the crisper jawline and lifted cheeks she wanted. Her early jowling, nasolabial folds and drooped cheeks have been corrected and now she no longer needs injectable treatments. 40-year-old Facelift Before and After. This woman just turned 41 when she decided to have a ponytail facelift. She has a thin face and the amount of filler she required for rejuvenation became extremely costly, requiring multiple vials with each visit. 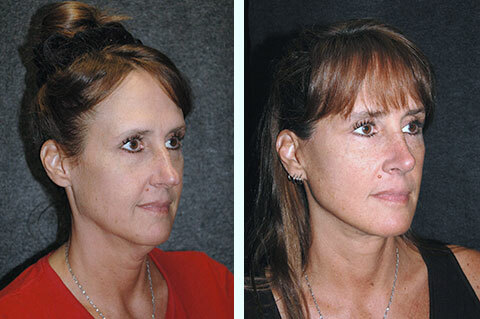 After her smile lines and nasolabial folds are smoothed and she reclaimed the definition of her jawline. Her hair is pulled back in confidence because the incisions cannot be seen with the ponytail technique. 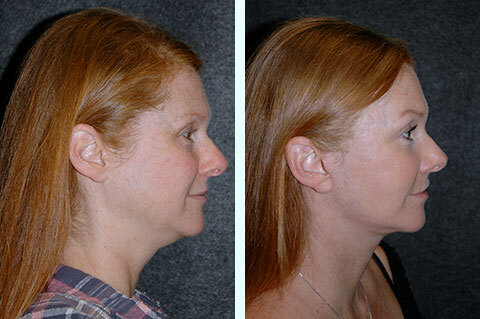 The result is a defined jawline, removal of early jowls and smile lines, and a firmer neck. Because it is less invasive, the recovery is usually 1 week. Doctor Jacono has performed hundreds of 40 year old mini facelift surgeries, and the average age for mini face lift in his practice is 45 years old. 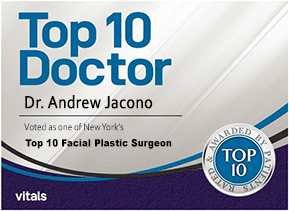 Dr Jacono sees his patients very happy with their decision to have a facelift at forty before and after. Facelifts are more expensive than non-invasive surgeries and have a longer period of recovery. However, the benefits are undeniable. Although these procedures can be expensive, they may actually be a more economical option for people seeking dramatic results. Dr. Andrew Jacono notes that these patients that chose to have a facelift at forty had already spent an average of $7,000 each on less invasive procedures. Doctor Jacono has treated many women who over 3 to five years have spent twice the cost of the facelift and still need to continue spending more money to maintain their non-invasive rejuvenation. Even though there is more cost upfront for a facelift, the results last a decade or more and you will spend less money over the long term. There are other benefits of having a facelift in your forties. Facelifts performed when you are younger look more natural. Our facial tissues thin with advanced aging and the face can appear more taught. Additionally, facelifts performed at a younger age last longer. The facial tissues are stronger and more supportive in our youth; therefore, the facelift holds up better. The beams are stronger if you will. With advanced aging our facial tissues become atrophied, thinner and less supportive. 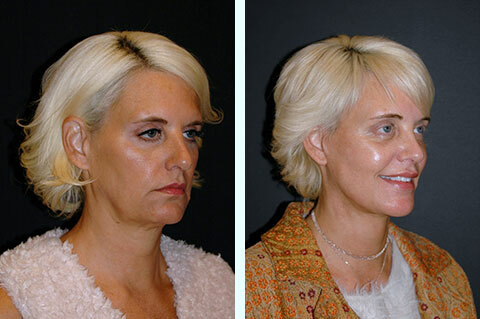 A facelift in the forties will last twice as long as one performed on a patient in his or her sixties. 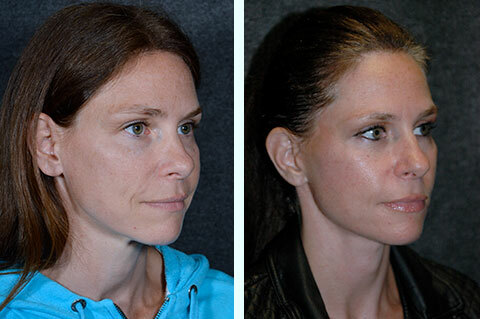 Ponytail Facelift Mini Facelift Before and After: This woman in her late forties wanted to lift her drooping cheeks and nasolabial folds and recreate a tighter jawline and get rid of her jowls. 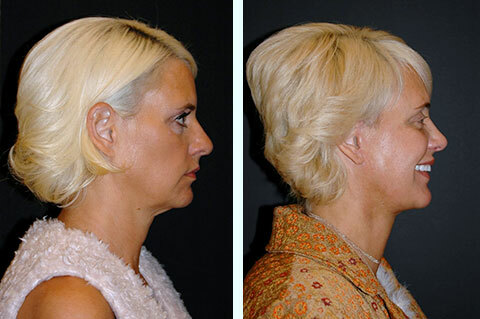 She had a mini facelift with deep plane facelift lift of her fallen facial musculature. A ponytail facelift incision was used so the incisions are hidden on the inside and behind the ear so the hair can be worn up with a ponytail. She has her upper eyelid lift and lower eyelid lift with a fat transposition to fill her under eye circles performed at the same. 40-year-old Facelift Before and After. This woman in her later forties was tired of everyone telling her she looked tired. Fillers and Botox were not giving her the same rejuvenation they had in the past, so she consulted to finally fix the problem with Doctor Jacono. 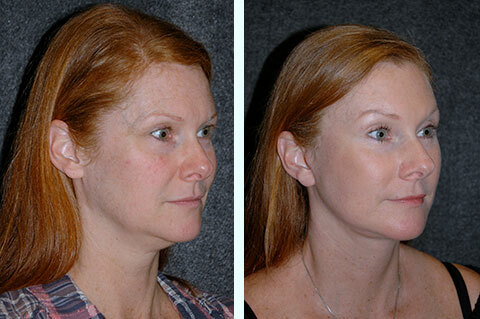 She had a mini face lift, browlift and rhinoplasty to complete her rejuvenation. Although facelifts are becoming more popular among an increasingly young patient population, they are still an effective way for more mature women to take years off their appearance. In addition, non-invasive procedures remain a great option for people of all ages. As Dr. Jacono notes, “Since there is no ‘one-size-fits-all’ approach to facial rejuvenation and surgery may not be right for everyone, I recommend that all facial plastic surgeons incorporate nonsurgical techniques into their practice to best serve the individual needs of the modern patient. 40-year-old Facelift Before and After. This woman in her early forties is in a high image conscious industry where most people are young. She had a mini face lift to help reduce her facial aging by ten years, but still looks natural. A short incision ponytail technique was used so she could put her hair up without the scars being visible. If you or a loved one are considering a New York facelift or other cosmetic procedure, Dr. Jacono’s Park Avenue office should be the first stop on your journey. One of the top facelift surgeons in the world, Dr. Jacono offers personalized consultations to help you decide what procedures will help you to get the beautiful, youthful result that you desire. 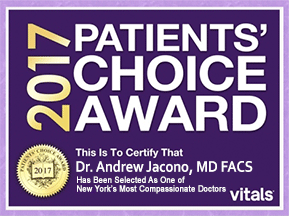 Publishing in the major journals on new innovations in cosmetic surgery, Dr. Jacono is one of the top New York plastic surgeon. As the author of The Face of the Future, the Park Avenue Face and a featured guest on shows such as Good Morning America and CNN, he is one of the foremost experts on new cosmetic procedures and trends in the United States. To find out more about his Manhattan practice and the procedures he offers, contact his office at (212) 570-2500 or complete an online contact form today.